One of my favorite blogs is The Perfect Nose. The Nose is responsible for my new addiction to tunics She makes them in wonderful fabrics and always looks so chic and effortless while drinking Midori’s that well, I had to try it. Plus, they are a breeze to make. This one has a few issues. It is a bit expansive across the chest and falls off my shoulders in an annoying way. And, it isn’t quite flowy enough around the hips. Oh, and I want to make the next one longer. It still isn’t quite wearable yet, the weather here is chilly spring temps, but, that will give me time to prefect it. So, get the Midori’s ready and find some hunky Australians, or whatever might be a decent substitute here in Colorado, it’s going to be a Tunic Summer. I apologize for not getting back sooner! Thank you so much for this! I’ll follow through when I get to my laptop!! Thanks again! Oh my you have something marvelous there and I too can’t wait to see pics of you in it in some sunshine! With midori lol! Can’t drink the stuff me so you can have mine too 🙂 I think I’m going to have to check out tunics too – between you and The Nose I’ve been won over…. Ah, thanks for that! I love the Nose too, she’s got such great style. I LOVe this fabric! gorgeous colours!! Wow that fabric is gorgeous. I couldn’t agree more with your new tunic mojo – TJ has much to be blamed for there LOL. Yes! There might be even be a meetup inspired by tunics in the future! Jill Have a great day! And, we’re getting about 6-8 inches of snow tonight. Back in the closet for now. Pizza wheel, I need that in my sewing box. Yes, I’ve been reading your posts on the big pattern makers and the weird ease issues. 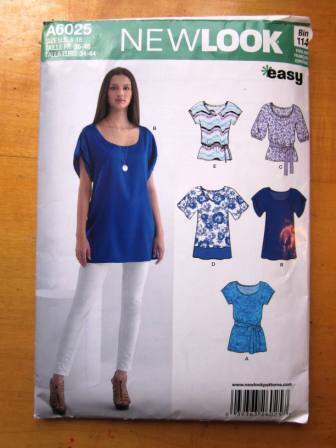 I’m experimenting more with Burda but have not branched out further than that. Yet. haha I meant rotary cutter. Carl keeps threatening to steal mine for pizza purposes because it’s the 45cm one. Cheers for the link love. 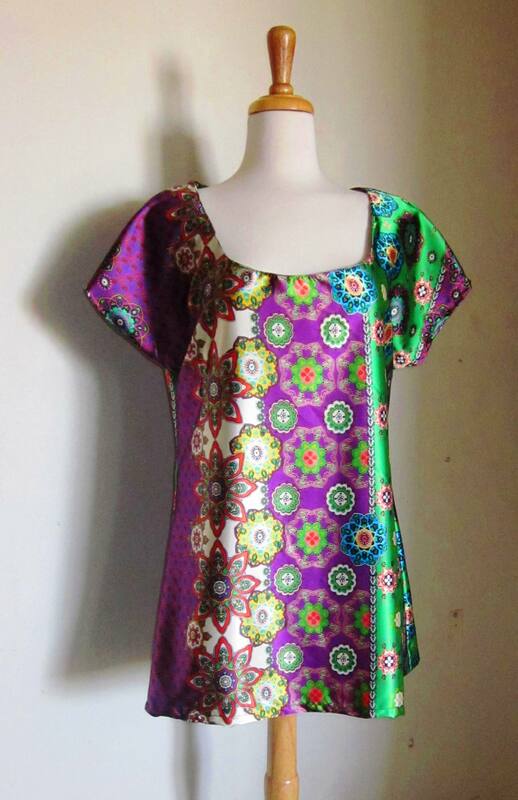 I love the jewel colours in this fabric. Stunning! Perhaps some nifty little straps with press studs on the inside of the shoulders to snap around your bra strap. Then it wont fall off! Now, that’s a good idea! It’s been saved! Hallelujah! Yes, a real eye-catcher this one! Jill, i think the fabric is lovely!!! So you. Did you add stay tape to the neck? That may help keep it on the shoulders. Or perhaps it’s just too big? Bring it to DSC; someone will have a good suggestion. I got the fabric at Jo-ann’s. And, I didn’t use stay-tape. But, I think it really is too big. Even in the photo you can see how wide it is on the model too. Plus, I have kind of narrow shoulders. I also forgot to put interfacing on but, whatever. LOL. I love the colors. Can’t wait to see the one you make perfect!! I love the fabric too, I might just buy more when I get it all ‘perfect and do it again’!